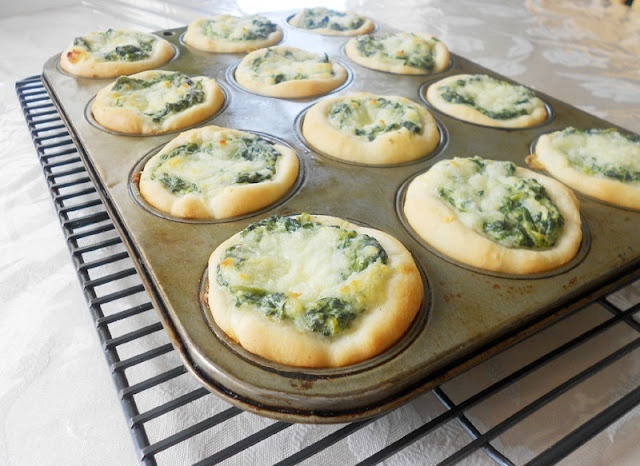 Preheat oven to 350 degrees F. Spray 15 muffin cups with non stick cooking spray. In the bowl of a stand mixer, fitted with the dough hook, add flour, olive oil, and salt. Add yeast to 1/4 cup of lukewarm water; sprinkle with about 1/2 teaspoon of sugar, stir, and then set aside and allow the yeast to dissolve. In about 10 minutes, the yeast should be frothy and foamy, indicating it has risen. Add the yeast mixture to the bowl of the stand mixer. Set mixer speed to stir and mix ingredients until they are incorporated. Increase the speed to medium, and gradually pour in the milk. Allow the mixer to knead the dough for about 3-5 minutes, until it is fairly smooth and pulling away from the sides of the bowl, leaving the sides relatively clean. Cover the dough and let it rise for an hour. Heat oil in a medium skillet over medium heat. Add spinach and cook for about 3-5 minutes. Then add garlic and cook and stir for another minute or two, then remove from the heat. Place cooked spinach and garlic, cream cheese, sour cream, Parmesan Cheese, cayenne pepper, garlic salt, salt, and black pepper in a medium bowl. Mix together until well combined. Once the dough has risen, squeeze off 15 balls of dough. Using your hands, flatten each ball of dough into a thin disk and then press into the bottom and up the sides of the muffin cups. With a medium cookie scoop (or tablespoon), scoop dip into each of the centers of bread bowls. Top evenly with shredded mozzarella cheese and bake for 15-17 minutes. until just turning brown on edges. Remove and let cool for 3-5 minutes before removing from muffin tin.